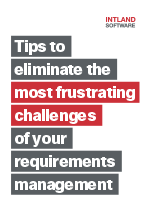 Requirements Management is the most critical phase of any software development project. This eBook looks at the most common issues faced in the process of requirements engineering, as well as the solutions to these problems. What Makes Agile Requirements Management Agile? What features of Requirements Management tools enable the use of Agile in an enterprise setting? Collaboration & documentation: How to keep all team members in the loop?